To accompany the new scholarly edition of Apicus Sally Grainger has gathered, in one convenient volume, her modern interpretations of 64 of the recipes in the original text. This is not ‘recipes inspired by the old Romans’ but rather a serious effort to convert the extremely gnomic instructions in the Latin into something that can be reproduced in the modern kitchen which actually gives some idea of what the Romans might have eaten. Sally Grainger, therefore, has taken great pains to suggest means of replicating the particular Roman taste for fermented fish sauce. It may sound unpleasant, but actually is not too far removed from the fish sauces of the Far East and any reproduction of Roman cookery must depend on getting this particular aspect right. Not all the recipes are for mad Roman luxuries such as lark’s tongues and boar’s bottoms, she has taken care to include perfectly do-able and affordable dishes such as cucumber with mint dressing, duck with turnip, roast lamb with coriander, carrots or parsnips in a cumin-honey glaze, almond and semolina pudding, and deep fried honey fritters. The advantage of this manual over those that have come before is that it is more accurate and benefits from all the hard work that Sally Grainger and Christopher Grocock have put into getting the text of Apicius itself into some sort of working order. For years, people reconstructing Roman food have taken Apicius literally, and without any thought into the many elements of Roman food. Usually, the food is at best tasteless, often inedible, and the excuse is usually an emphatic “this is how the Romans did it! Their taste is not ours”. 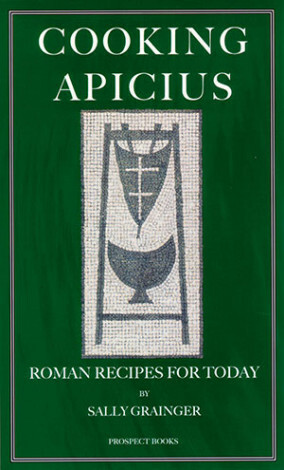 Rather, Apicius is a guide for experienced cooks, much like 18th and 19th century US cookbooks, where the recipe leaves almost all the explanations and cooking instructions out. Sally Grainger has done meticulous research into the elements of Roman cooking, and actually worked the recipes out into very palatable dishes. I’ve read through almost all the so called Apicius cookbooks and this is by far the most thorough explanation of the ingredients and how they are made, including mulsum and garum, and in-depth descriptions of the unusual seasonings like lovage. This will change how our reenactment and reconstruction efforts will present Roman food from now on, and make the accompanying academic book that much more interesting. In a brief and lively introduction, G. skips through some of the major issues dealt with in the scholarly edition reviewed above: Apicius is a ‘blue collar’ collection of recipes for cooks, not a literary confection for the upper class gourmet. Indeed she identifies the consumer of the recipes as ‘ordinary well-to-do Roman knights, businessmen and traders of all kinds, land-owners and skilled craftsmen’ along with the odd (successful) prole. And who will be the modern consumer? Well, they will need a garden and an enthusiasm for pestle and mortar. Though neither are essential in the era of blenders, food processors and coffee grinders, ‘authentic’ paste is still best produced in the traditional manner. G.’s advice about the preparation of herbs and spices is both practical and, at times, potentially life-saving (don’t confuse your bay with the very poisonous flowering laurel). Her expertise and practical knowledge are constantly illuminating and encouraging, delivered with a restrained enthusiasm which makes it hard to resist the urge to plunge into kitchen wielding a dry frying pan and a packet of herbs. But that would be too hasty. G. encourages ‘subtle restraint’ since the aim is to recreate ‘complex sauces that are not overpowering’ and you will need to invest in your ‘Roman store cupboard’ to have at hand the range of essential ingredients. Some are easily obtainable; on the rest, G. offers practical advice. Fish sauce, defrutum and other special components are discussed before the core of the book, the recipes: 15 hors d’oeuvre/side dishes, 19 meat dishes, 13 vegetable side dishes, 7 fish dishes and 6 desserts, all designed to serve 6 modest helpings. Some have appeared in her earlier The Classical Cookbook, but are now modified. The paucity of desserts in Apicius may be, as G. explains, because they were generally uncooked: ‘fig’ hardly constitutes a recipe. What to try first? Beans in mustard sauce turns out to have ‘Baian’ beans specified – Helen’s favourite no doubt. G. offers a list of suitable alternatives, but it is the sauce that seduces with mustard, rue and vinegar balanced by honey and white wine and topped by pine kernels and cumin. Roman cookery is nothing if not adventurous and stimulating. To G., who modestly admits that these are not definitive interpretations, we owe a debt of gratitude for giving us a taste of ‘the reality of being there’ and producing the most practical Apicius yet. Buy this for the school library without delay.